This week I had to get a new kettle. “Not very exciting”, I hear you say, but I am something of a traditionalist, and I have a kettle that goes on the gas hob. So I went and bought a new bright red kettle to replace my faithful old one. You’ve heard about the Japanese Tea Ceremony, well, I too, make a ceremony out of tea. 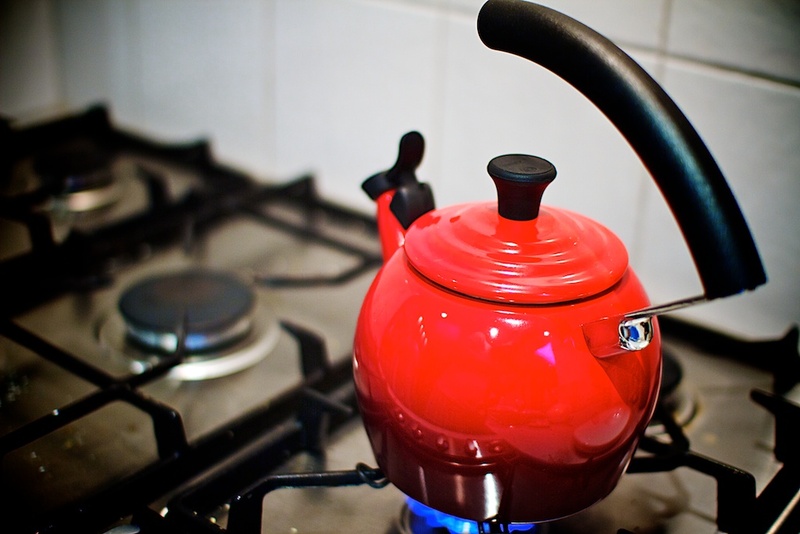 I boil my lovely red kettle on the gas, it takes longer than an electric one, but for me that is part of the enjoyment of my tea. The time it takes forces me to slow down. Then I choose my tea, I drink leaf tea and I have a number of different teas from all over the world. Each tea carries with it memories: the rose tea from France reminds me of our time there for a friend’s wedding; the Harrods English breakfast tea, a surprise gift from my husband when he had to travel; the white tea I bought after a particularly hard day last year. Then I make a pot and sit down to have my cup of tea. I feel like you can drink coffee on the run, but to properly enjoy tea you need to sit down and take your time, savour the flavours and let the scent, taste and warmth of the tea slowly relax you. Cross off list – get new kettle. Add to list – make cup of tea. How cool … it reminds me of the character Vianne in chocolat who makes just the right chocolate for each persons situation.